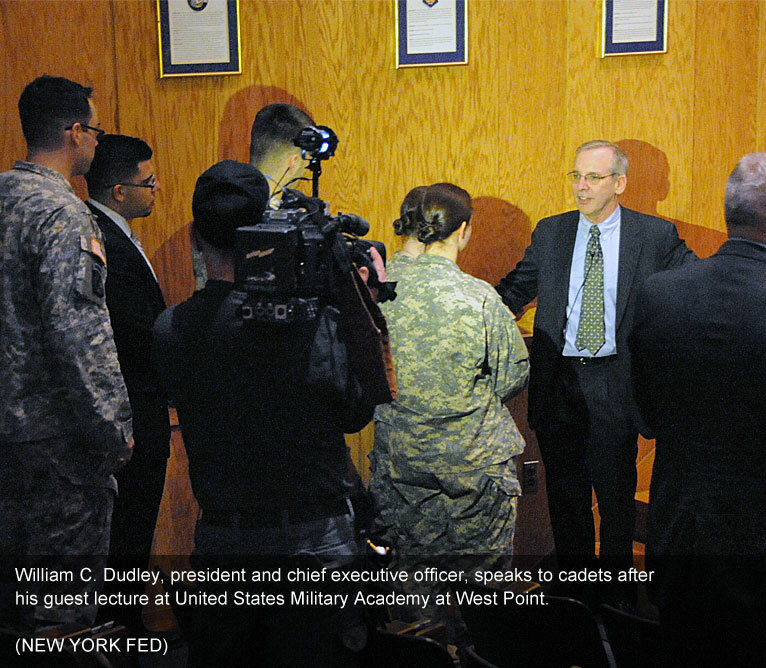 I am honored to have the opportunity to speak to you today in the hallowed halls of West Point. I do not need to tell anyone here of the long and distinguished tradition of this institution and the U.S. Army. I believe that the U.S. military is one of our nation's greatest institutions and a living demonstration of the best of America. Your example of national service inspires us all to live up to our duty to do all we can to advance the national interest. I am the president of the Federal Reserve Bank of New York, part of the Federal Reserve System that serves as our nation's central bank. In this capacity I am also vice chairman of the Federal Open Market Committee (FOMC), the Federal Reserve committee that sets interest rates and makes other decisions about monetary policy. This committee sets policy to advance the mandate given to us by Congress: to promote maximum employment and price stability. In the support of these objectives I and my colleagues must also guard as best we can against threats to financial stability, because credit is the lifeblood of the economy. Without financial stability we cannot achieve good economic outcomes, as the experience of the past few years so painfully demonstrates. I will talk today about our nation's economy and the challenges that we face. As you know, the state of our economy is important not just for the well-being of our people, but also for the national security of our country. We need a strong economy so that we have the fiscal capacity and technological, industrial and educational dynamism to sustain a military capable of defending America's global interests. Today I will focus on why it has proven so difficult to generate a strong economic recovery. I will then lay out some prescriptions as to what we can do to put growth on a firmer footing. This is not just about what the Federal Reserve can do on the monetary policy front, but also about what other steps can be taken elsewhere—in areas such as financial stability, housing policy, fiscal policy, and structural adjustment to facilitate domestic and global economic rebalancing. Before I continue, let me remind you that the views I offer today are my own and do not necessarily represent those of my colleagues on the FOMC or the Federal Reserve System. We stand here today several years after the onset of the worst financial crisis in modern times. The origins of the crisis are complex, but it had its roots in the bursting of a credit bubble that had grown to great size during the middle part of the last decade. Prior to the onset of the crisis, a combination of rapid financial innovation and unbalanced global economic integration resulted in a mispricing of risk worldwide. This was particularly extreme in certain markets such as U.S. housing and housing finance. This mispricing of risk led to a misallocation of resources and an excessive build-up of debt in many parts of the global economy. Many—though not all—U.S. households responded to the easy availability of credit and rising home prices by taking on more debt. When the housing boom lost steam and began to burst, expectations about housing prices and wealth were disappointed. The bursting of the credit bubble also created instability within the global financial system, and this in turn resulted in a sharp constraint in the availability of credit for households and businesses. The result was what is now called the "Great Recession." Over the period from late 2007 through mid-2009, real gross domestic product (GDP) declined more than 5 percent, making this recession the longest and deepest recession of the postwar period. The recession manifested itself in many ways, but one of the most painful was the severe impact it had on the labor market. Employment dropped sharply during the recession, contributing to a sharp rise in the unemployment rate from around 4.5 percent in the middle of 2007 to over 10 percent in October 2009. Extraordinary actions by authorities around the world, including the Federal Reserve, prevented full-scale financial and economic collapse, and the global economy stabilized around mid-2009. But since then, the recovery has been bifurcated. While emerging economies have rebounded rapidly, the developed world has grown only slowly. This has hastened a historic shift in the balance of economic power that was already underway before the crisis. In the United States, the recovery has proven to be persistently weaker than expected. Growth has been insufficient to either bring down unemployment significantly or to achieve a self-reinforcing cycle of strengthening confidence, demand, income and employment. Although the latest news on the U.S. economy is somewhat more encouraging than that from earlier in the year, we should not take much solace from that. After a very weak first half, when growth was less than one percent, economic activity has strengthened somewhat and inflation pressures are starting to ease. Growth in the third quarter is currently estimated 2.5 percent, and recent indicators suggest growth in the fourth quarter could be somewhat higher. However as we look toward 2012 the U.S. economy continues to face several obstacles to a robust economy. Accordingly, I expect growth of about 2.75 percent for 2012, not much higher. We also continue to face significant downside risks, mostly related to the stress in the eurozone. We cannot be satisfied with the current state of the economy or the outlook for the next few years. The economy is operating far below its productive potential –leaving the levels of output, income and employment much lower than they would be if the economy's unused resources were put back to work. One summary statistic says it all—the unemployment rate is unacceptably high at 9 percent. So why has the U.S. recovery been so underwhelming? I think the answer lies in the nature of the boom in credit and housing, and the collateral damage that the bust caused to household balance sheets and to the financial system. Recoveries that take place in the aftermath of severe financial shocks and big declines in asset prices that were mainly funded by debt require highly indebted borrowers to deleverage, or in other words, pay down their debts. These shocks and asset price declines, in turn, generate large losses for the financial sector that tightens credit availability and further restricts demand. With weak demand comes weak income growth. Meanwhile, financial and economic volatility and the uncertainty this creates about prospects for future incomes causes those who retain access to credit to hold back. What we have learned, I think, is that the power of these economic forces is even stronger than we had previously understood. And, in such circumstances, although a stimulative monetary policy is essential for recovery, it may not be sufficient. 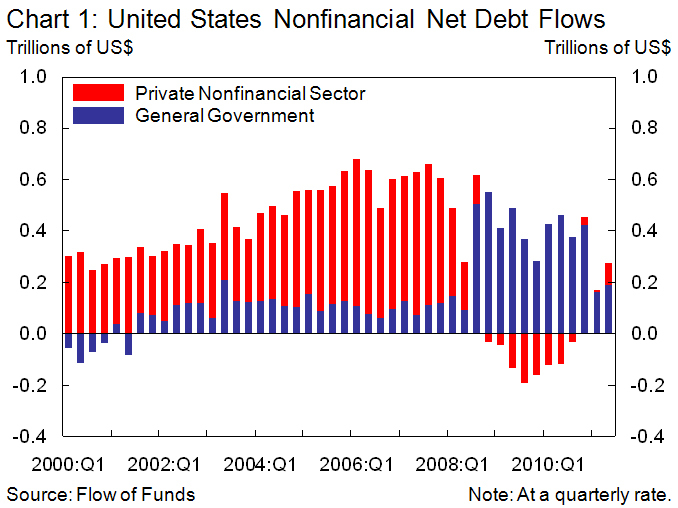 To illustrate the problem, let's begin by examining net debt flows in the private nonfinancial and government sectors over the last 10 years. As can be seen in Chart 1, borrowing by the private nonfinancial sector rose rapidly from 2003 to 2006 and remained high until the crisis hit. Then borrowing turned negative as new loans were more than offset by repayments and write-offs. Only recently has borrowing turned weakly positive. 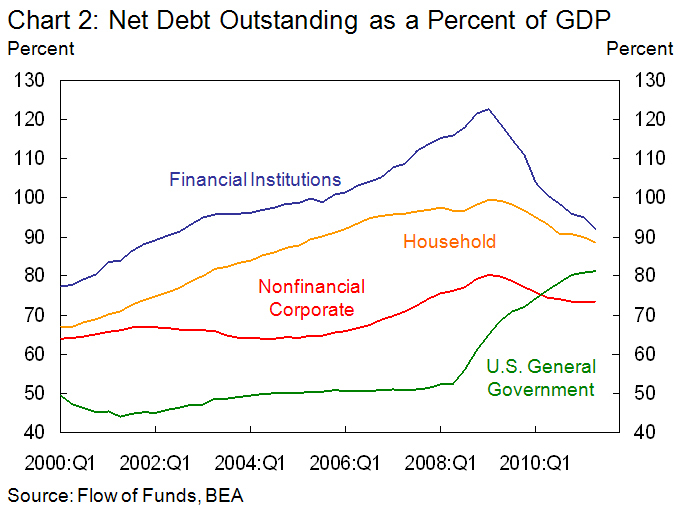 Chart 2 illustrates how the stock of net debt in different sectors of the economy evolved throughout this period. It shows that much of the credit boom was concentrated in the household sector. The business sector only experienced a surge from 2006 onward. During the boom, leverage also increased in the financial sector. As the boom proceeded, credit losses were low and earnings strong. But once the bust began, this dynamic reversed. Credit losses at financial institutions surged and the sector was forced to deleverage rapidly and raise new capital. This resulted in a significant contraction in the availability of credit and was a major direct shock to the global economy. Crucially, this tightening of credit standards exacerbated how much many households and firms had to deleverage. It also crimped demand, inhibiting economic, employment and income growth, which in turn made the deleveraging process more challenging. The nature of this process can be usefully illustrated with a simple, but important accounting identity based on the difference between current income and expenditure in each of the nonfinancial sectors of the economy. For each sector, this difference we call the balance. If the economy were isolated from the rest of the world, then government-sector balance and private-sector balance would add up to zero. As can be seen in Chart 3, when the crisis hit, the private-sector balance moved quickly into positive territory as households in general tried to save more, and this was accommodated by a record government deficit and a smaller current account deficit. 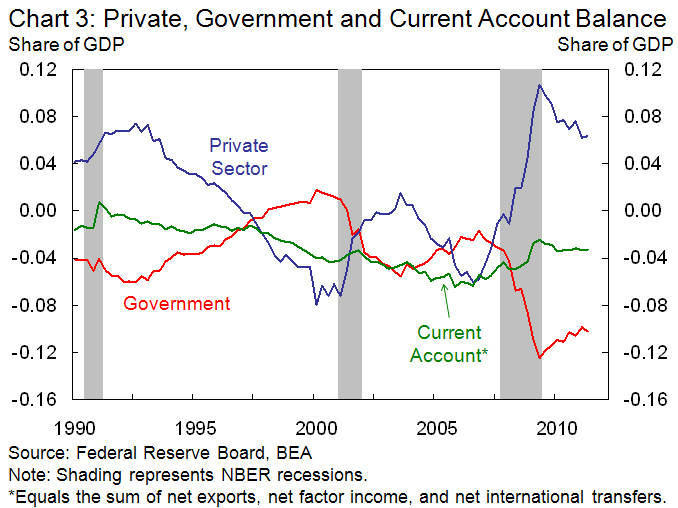 More recently, the private-sector surplus has declined and the government deficit has decreased, with little change in the external balance. This distribution of surplus and deficit across the economy's different sectors illustrates a substantial challenge for U.S. economy. In the early stages of adjustment, it was quite appropriate for the government to offset part of the sharp increase in private-sector net saving with increased borrowing. If this had not occurred, the recession would have been even deeper. But at 10 percent of GDP, the government-sector deficit must be reduced over time to avoid creating an unsustainably large government debt burden. This decrease in the fiscal deficit has to be offset by some combination of a smaller current-account deficit or reduced private-sector surplus. Over time, the U.S. economy needs to increase net exports. However, a rapid turnaround will be hard to accomplish in a world in which most other nations are also looking to increase net exports to support retrenchment at home. So it appears likely that even as we try to lay the foundation for a more export-oriented economy, securing the recovery will require help from the domestic private sector—a smaller private-sector surplus. But if highly indebted households continue to deleverage, while those households and businesses with low debt remain very cautious about spending and investment, there will be little impetus in this direction. In that case, the U.S. economy will have trouble building forward momentum. The financial sector also plays an important role in this process. If credit availability remains tight, then households and businesses may not be able to increase their borrowing even if they want to. While major financial institutions in the United States have strengthened their capital positions significantly since the peak of the crisis in 2008, and deleveraging has abated, the financial system as a whole is still undergoing a process of repair. To understand our prospects a bit better, we need to look at the likely behaviors of business and household sectors separately. Circumstances for the business sector are mixed with larger corporations generally in much better shape than smaller businesses. Many large corporations entered the recession with healthy balance sheets. While leverage1 did increase sharply in the recession, it has subsequently come back down to levels similar to the 1990s. Record profit margins have enabled large corporations to build substantial buffers of highly liquid assets. Large businesses are cautious because of concerns about the sustainability of growth and demand, political dysfunction, the health of the financial system and their ability to retain their access to credit throughout the business cycle. For smaller firms, the situation is generally more difficult. Because this sector has a higher exposure to real estate, falling real estate values pushed up leverage for this group and it remains well above previous historical highs. Although small businesses identify weak demand as their major problem, the availability of credit is also an issue. An improvement in their ability to obtain credit would seem to require some stabilization of real estate prices and a substantial increase in demand for their products and services. Turning now to the household sector, Chart 4 shows that a combination of the fall in interest rates, paying down of debt and debt write-offs has substantially lowered the share of income required for households to service their debt. However, as shown in Chart 5, the average homeowner still is substantially more leveraged than before the crisis and has lower net worth. One significant problem is the trajectory of home prices. 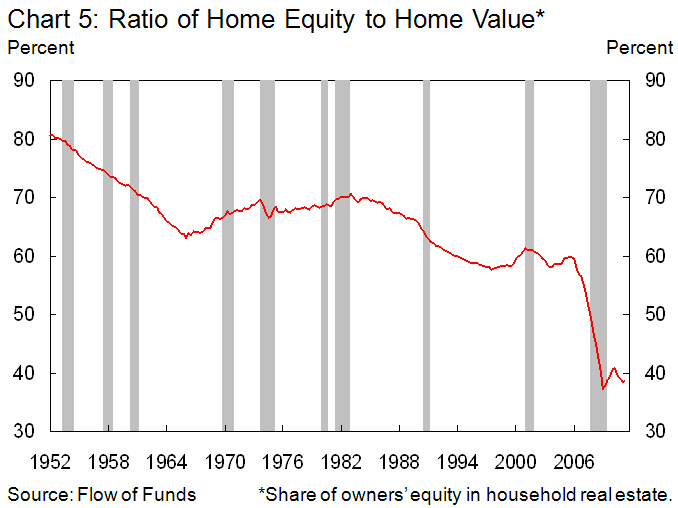 Homeowners have lost more than $6,000 billion in home equity since the housing market turned. For homeowners with mortgage debt, about one-quarter of these homeowners have mortgage debt that exceeds the value of their homes. The loss of home equity is a serious problem in itself of course, but it has been exacerbated by the fact that many households have found it very difficult to refinance to take advantage of lower mortgage rates. Without a substantial improvement in the ability to refinance, the outlook for real estate prices, and in income prospects, it seems likely that many of the households that ended up with too much debt after house prices fell 30 percent from their peak may need to deleverage further. This implies that for the household balance to fall and provide an impetus to growth, those households with low debts will have to spend more of their income. In many ways these households are in a similar situation to large corporations: their balance sheets contain substantial liquid assets. They are undertaking precautionary saving as a response to greater uncertainty about the economic outlook and their long-term prospects. In more normal times, lowering short-term interest rates would induce households and businesses to spend more or invest more in less liquid long-term assets as the real return on their liquid short-term assets fell. The increase in expenditures produced by this change then would lead to increased employment and income growth, higher assets values and a virtuous, reinforcing circle. However, with short-term interest rates close to zero already and problems in the housing market, this standard rebalancing channel is not working as well as we would like. This discussion, I hope, has underscored two important truths. First, while deleveraging had to take place following the excesses of the boom period, both the extent of deleveraging on the part of those with high debts, and the degree of precautionary savings by those with low debts, depend on many factors, some of which can be influenced by the policy choices we make. Second, the amount of deleveraging and precautionary savings depends on the availability of credit and the health of the financial system and upon the degree to which income is sustained during this deleveraging process. Note that if income growth is sufficiently weak, households may struggle to achieve desired increases in savings and reductions in leverage, which appears to have been the situation of late. So what should be done? What should economic policy do to secure the recovery and provide a sustainable environment for long-term growth? Clearly, monetary policy will continue to have an important role. But other, complementary, policy initiatives will also be important. Monetary policy is important as a means of sustaining aggregate demand at a time that the deleveraging process is not yet fully complete and credit availability remains impaired. Sustained low interest rates help support financial asset and house prices, induce households and firms that do not have high debt to save less and spend more, and enable households that do have high levels of debt to refinance them at lower rates. This reduces the amount of deleveraging that has to take place. However, the ability of monetary policy to provide additional support is somewhat constrained by the zero bound—the fact that we cannot lower short-term interest rates below zero, and have to rely on other, less efficient means, to put further downward pressure on longer term borrowing costs. As a result, it becomes progressively more difficult to induce households with low-debt to bring forward consumption by buying motor vehicles or other consumer durables, and to provide further support for asset prices and household net worth. Finally, problems in housing mean that this sector is relatively unresponsive to the low level of interest rates. Despite this, we are not out of ammunition. Although short-term interest rates have been effectively at zero since December 2008, the Federal Reserve has used other tools—such as balance sheet expansion and communication policies to lower longer term rates and make financial conditions more supportive of growth. We could do more in both directions. For instance, we could elaborate on our forward commitment to keep short-term rates low. Indeed, I believe it would be desirable if the committee were able to provide additional guidance as to the economic conditions that the committee would expect to see before raising interest rates. And we could purchase more longer term financial assets. If additional asset purchases were deemed appropriate, it might make sense to do much of this in the mortgage-backed securities market. This would have a greater direct impact on the housing market and would be less likely to disrupt market functioning compared with further purchases in the Treasury market. At the same time, we do have to recognize the costs as well as the benefits of further action. Forward commitment entails some risks to our credibility since it is difficult to capture all the considerations that go into policy judgments in simple and concise language. And balance sheet expansion has potential costs, as well. These potential costs stem not only because some may view balance sheet expansion as sowing the seeds of future inflation—an incorrect view in my opinion—but also because balance sheet expansion increases the amount of interest rate risk in the Federal Reserve's portfolio of assets and could, if carried to an extreme, harm private market functioning. Because reasonable people can differ over the costs and benefits of further action, you should not be surprised that there is vigorous debate among FOMC participants about whether more monetary policy stimulus should be applied. Don't take this debate for disagreement about the broader goal: I am convinced that all FOMC members are committed to taking whatever steps they deem would help advance the dual mandate of price stability and full employment. For my own part, I am deeply unhappy with the current forecast of prolonged high unemployment, and will continue to review whether there is more that we could do that would bring more benefit than cost. Monetary policy must do its part. But there is a strong case for complementary policy actions because such actions can help secure better outcomes than can be achieved through monetary policy alone. If we are to achieve the best possible recovery and build for the future, we will also need ongoing efforts across four broad fronts: financial stability, housing policy, fiscal policy and structural adjustment to foster more sustainable U.S. growth and a more balanced global economy. Ongoing attention to financial stability and the reform and repair of the financial system is essential to support recovery. We need to make sure this proceeds in a manner that is not pro-cyclical, and for this reason we are, for instance, phasing in new capital and liquidity standards, and monitoring how institutions adjust to the new requirements. Nonetheless, the financial system must be healthy to support sustained access to credit. If we want those households and businesses with low levels of debt to reduce precautionary saving, we need to restore their confidence in the financial system. This means providing credible assurance that the financial sector is in solid shape today and that the restructured financial system will be able to reliably supply credit across the business cycle – ensuring there is no 2008-style sudden sharp constriction in credit availability. For this reason, policies that increase financial stability, both ex ante by eliminating incentives for excessive risk-taking and making the system more robust to failure, and ex post, by ensuring the capacity to respond to a major shock, will help support growth today. The process of financial repair also matters greatly in terms of high debt households, since underwriting standards help define how much deleveraging must occur to regain access to credit. While we do not want a return to the easy credit standards of the bubble period, we also don't what to overshoot in the opposite direction. Housing is another area where policy can support the recovery by helping to stabilize house prices and housing activity. Housing is the most important tangible asset for most American households, and housing debt the biggest liability. Obstacles to mortgage refinancing undermine the impact of monetary policy. Moreover, declines in house prices and the risk of future declines directly affect the degree of deleveraging that needs to take place among homeowners with high levels of debt, and the extent of precautionary saving by homeowners with low levels of debt. While home prices had to correct following the bubble, they no longer appear overvalued relative to historic multiples of cash flow, income and rents. But it would be unwise to simply assume the market will bottom out at these levels for three reasons. First, expectations of house price declines can easily be self-fulfilling. The feared loss in value can overwhelm the benefit of low mortgage rates, leading would-be buyers to sit out the market. Second, with home construction at minimal levels, housing supply cannot decline in response to weak demand. Home prices thus are very sensitive to shifts in demand and credit supply. If access to mortgage credit for home purchases is unduly restricted, the market-clearing price for housing will be lower than it would be if access to mortgage credit was less constrained. Third, in contrast to the efficient mechanisms in place in the commercial property market to work-out troubled debt, the infrastructure of the residential mortgage market is wholly inadequate to deal with a systemic shock to the housing market. Left alone, this flawed structure will destroy much more value in housing than is necessary. 5) manage the disposition of homes repossessed by creditors in a manner supportive of large-scale conversion into rental units. I am encouraged by the recent decision by the Federal Housing Finance Agency (FHFA) to make it easier for certain borrowers with high loan-to-value ratios to refinance. I hope this initial step will be followed by others that collectively move in the direction of stabilizing house prices. I believe this would not just be good economic policy, but it would also be extremely beneficial for taxpayers, who now effectively own the credit risk of those home loans guaranteed by Fannie Mae and Freddie Mac. On the fiscal policy front, ongoing support for demand from the public sector at a time when many households are deleveraging sustains jobs and incomes. But this can be partly or wholly offset if households and businesses lack confidence in the long-term fiscal outlook for our nation. It would be greatly beneficial if the Administration and Congress could more effectively work together to craft a coherent fiscal policy. As I see it, this would consist of two elements—continued near-term fiscal support to underpin economic activity and long-term fiscal consolidation to ensure debt sustainability. 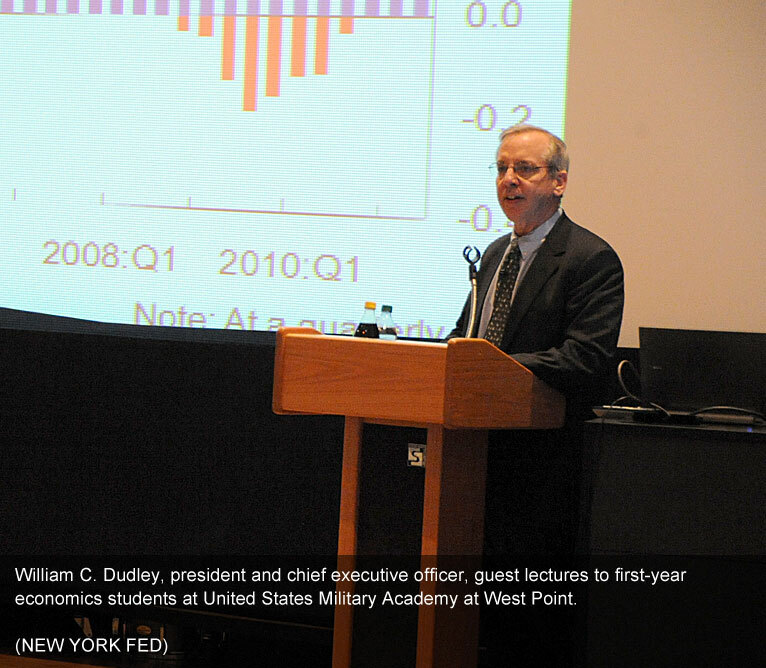 Without action in Washington, fiscal policy will turn sharply restrictive in 2012—exerting a direct drag on real GDP growth of more than one percentage point. At the same time, the long-term path under current policy is unsustainable. It should be possible, even in a time of sharp ideological differences, to agree on some common pro-growth principles: support for demand today made possible by credible long-term fiscal consolidation, and a mix of fiscal adjustments that are supportive of future growth. This would involve making an appropriate distinction between outlays that support current consumption versus outlays that lift the economy's long-run potential such as investment in infrastructure, research and human capital—similarly, between taxes that inhibit work and investment versus those that are more neutral in their impact. Broadening the tax base and making tax system simpler might also be helpful. Progress on the fiscal front would have an important ancillary benefit—a demonstration that Washington can put aside partisan interests and step up to the challenges our nation faces would boost household and business confidence. Finally, we need structural adjustment policies to facilitate the reorientation of the U.S. economy away from the growth path of the previous business cycle—away from a reliance on asset price gains and easy credit to support consumption to a more durable long-term growth path with greater reliance on business investment and exports. As I discussed in a previous speech, we can learn from the example of emerging nations that took the tough decisions necessary to emerge from past crises stronger, more competitive, and better positioned to take advantage of their comparative advantages in a fast-transforming world economy. This means not just plugging gaps of deficient demand, but also solving structural problems. Done right, such structural reforms would provide the foundations for long-term growth. But this would also support the recovery today. By boosting household and business confidence about the future and about their future income prospects, this would reduce the need and desire to further deleverage and increase precautionary savings. A structural adjustment program for the U.S. would include a number of elements beyond those already mentioned. These include labor market policies to retrain workers, investment in education and infrastructure, more efficient regulation, more efficient provision of healthcare services, and pro-growth trade and immigration reform. Steps that raise the productivity of U.S. workers lead to rising living standards. Also, they can help put the economy on a more sustainable fiscal path. Higher productivity leads to a bigger economy that can more easily support the ever increasing number of retired workers. As we take such steps to put our own house in order, we could reasonably look to other nations to take complementary steps to promote global economic rebalancing. By spurring domestic demand growth, emerging market economies could support global activity while enabling their own citizens to reap the full benefits of the remarkable increases in productivity and output they have achieved in recent years. If we were to take all the steps outlined above, then I think we will have a pretty good 2012, with even better prospects after that. If instead, it is all left to monetary policy, then the outlook will be much less satisfactory. My baseline forecast—absent the full suite of complementary policies to support growth—is that 2012 will not differ much from the second half of 2011: moderate growth, slightly stronger employment and some moderation of inflation. But I worry about the downside risks to this forecast especially if the stresses in Europe continue to escalate, or if little progress is made on housing, fiscal policy and global rebalancing. In particular, accommodative monetary policy becomes much less effective if the housing market remains in the doldrums. I know that I have laid out here today a daunting set of policy objectives in an environment that is quite challenging. But before being discouraged by that, let's reflect for a moment on what we already have achieved to date and some of the reasons why success is fully within our grasp. 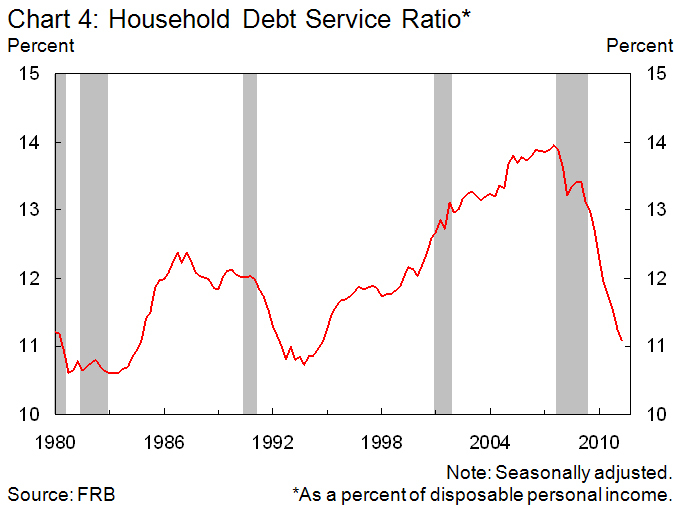 U.S. households have already undertaken considerable deleveraging. The U.S. financial system has made material progress toward better health. House prices are back at levels consistent with long-term affordability ratios. Banks have much more capital than they had on the eve of the financial crisis, the quality of that capital is much better and liquidity buffers are now much deeper. Credit availability is slowly improving. Though our challenges are large, we have come a good way already. And the policy challenges we face are not insurmountable. Even the long-term fiscal issues are not as intractable as some maintain; Social Security can be put on a sustainable trajectory with relatively moderate changes, and while Medicare and Medicaid are more complex, successful reform must be possible given that other industrialized economies spend a lot less on healthcare, often with better results across the population. Even with determined effort the road ahead will not be easy, and it will be several years before our economy once again operates at something close to its true potential and all who seek work have a good chance of finding employment. However, provided we secure the recovery, there is every reason to expect our nation will return in time to prosperity and solid growth. The United States has an extraordinarily flexible economy with a strong entrepreneurial bias that generates new opportunities, jobs and income. Our higher education system is second to none and the country remains a magnet for talented people around the world. The United States has better demographics than most developed countries and some very impressive institutions—such as the U.S. Army—that provide a pathway upward for all based on merit regardless of background. America's place in a fast-adapting world economy and the prosperity and economic strength of our nation will depend upon the choices we make. In this fundamental sense our economic destiny is in our own hands. Let's get at it. I would be happy to take a few questions. 1 Defined here as credit market debt to net worth.